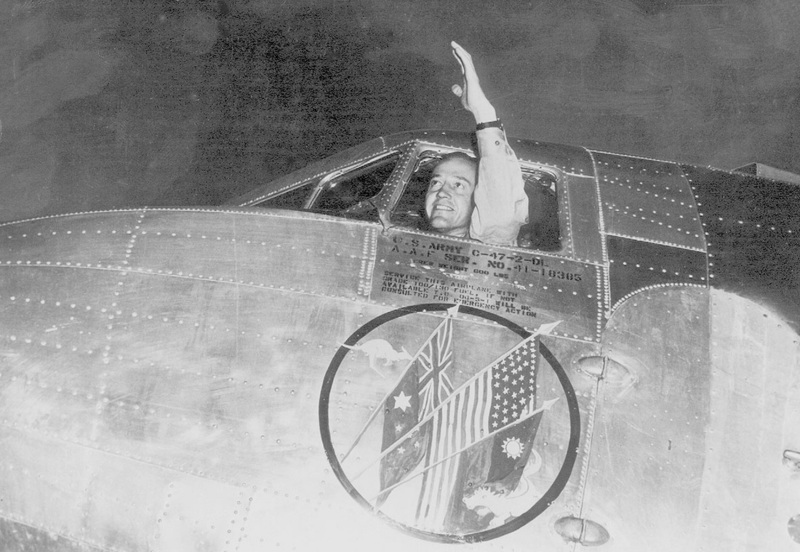 Roy Farrell waves from Betsy's cockpit in Sydney following what he claimed to be the first direct air service between China and Australia. 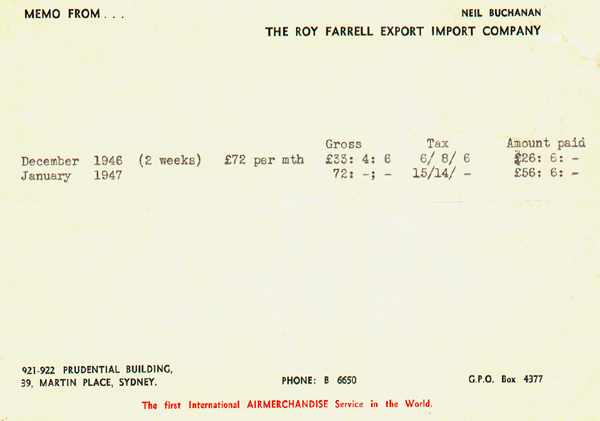 On December 16, 1946, I arrived at the Roy Farrell Export- Import Company's office in Martin Place, Sydney. It was the hour of my destiny. A likeable fellow named Eric Kirkby ushered me into a room where two other young men were waiting. I listened as they exchanged their flying credentials. They were discharged war veterans with flying skills that made my experience resemble that of a poor relation. Each returned from his interview beaming with satisfaction and clearly at ease. 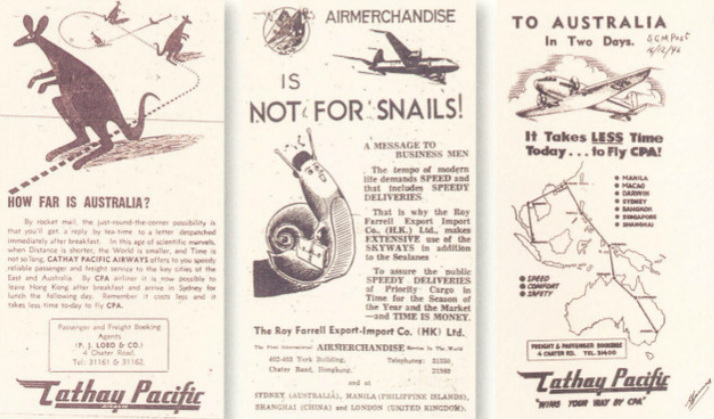 When my turn came, there sat Harry de Leuil; the same man who had once taken pity on a 16-year-old penniless youth and treated me to two flying lessons. He carefully checked my credentials and muttered that I had little to offer. 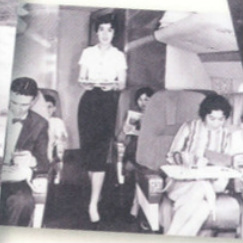 When I rose to leave, he motioned me back to my seat and rechecked my logbook and references. Finally, he muttered, "In addition to a Commercial Flying Licence, you also hold a Navigator's qualification." He then pushed back his chair and walked around the room a few times, before announcing: "The job is yours." 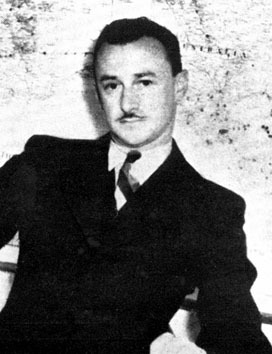 Mr. Harry de Leuil, Manager. 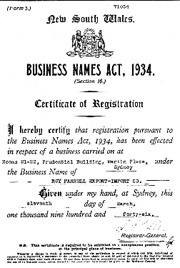 The Roy Farrell Export Import Company’s Certificate of Registration displayed at Rooms 921-922 Prudential Building, 39 Martin Place, Sydney, New South Wales, Australia. RFEIC’s memo detailing F/O Charles Chic Eather’s initial salary payment. My 32-year sojourn in the Orient had begun. Forty hours later, the glow of dawn painted a new day that found me at Sydney's Mascot Airport, strapped into the co-pilot's seat of Niki. With hardly a pause, Captain John "Pinky" Wawn poured on full power and an audible groan was heard as our overloaded plane left the ground. As a wide, gentle turn put us on a heading for our first refuelling stop at Charleville, my 32-year sojourn in the Orient had begun. Carrying a cargo mostly comprised of woollen goods in 180lb bales, we progressed through Cloncurry, Darwin, Sorido, Biak and Morotai without a problem, but excitement and danger lay ahead. In the meantime, l got to know the others aboard. 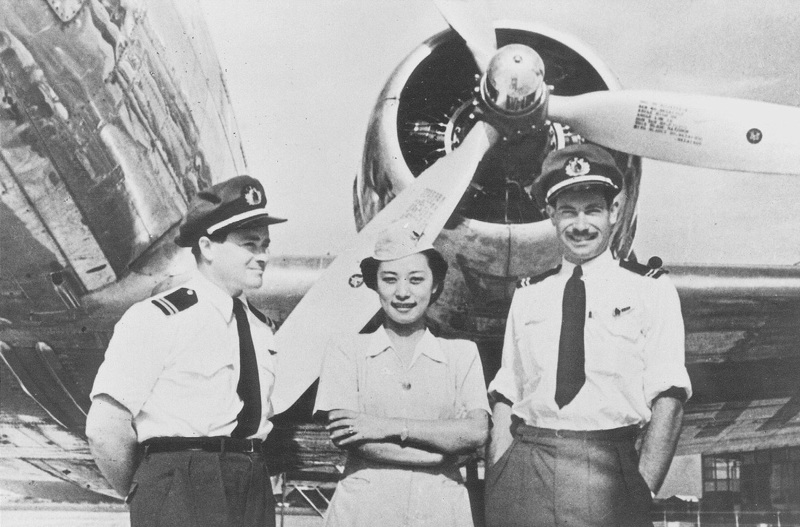 Pappy shared the co-pilot duties with me, and Lyall "Mum" Louttit was our sparks, or radio operator. 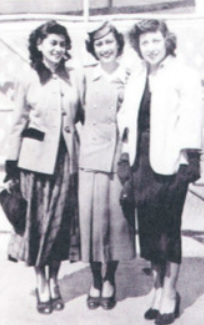 The others aboard were ground engineers Bill "Hokum" Harris, Jack "Pouch" Williams and Charlie Rowe. 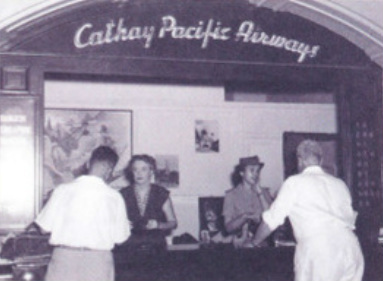 Hokum was Cathay's chief engineer, and Pouch and Charlie became prominent in establishing the great Hong Kong Aircraft Engineering Company (HAECO). 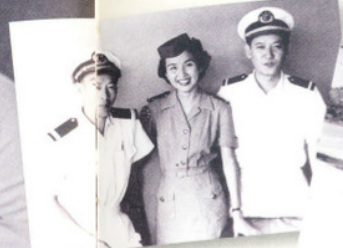 But while this was a noteworthy trio of engineering talents, Pinky's bride Kay fairly set the cabin aglow with no such qualifications. We landed at Morotai's tiny Pitoe strip in heavy rain that endorsed its reputation for foul weather. Morotai is an island just beyond the equator at the northern tip of Celebes. To my mind, Celebes resembles a dancing elephant with its trunk in reverse. We refuelled and took off in driving rain. The thin, scorching air added to the length of our take-off and, with coconut palms flashing by perilously close, I questioned my chosen career. Finally, when fate decided it had had sufficient amusement, Pinky got us into the air, but this was only a brief respite as continuous turbulence and lightning strikes precluded boredom. Just when a betting man would have wagered that things could get no worse, the port engine packed up. At this stage, we were an hour out of Morotai cruising at 9,000 feet, and with George doing his best to relieve our workload, I had a spare moment to realise I was probably in the wrong environment. 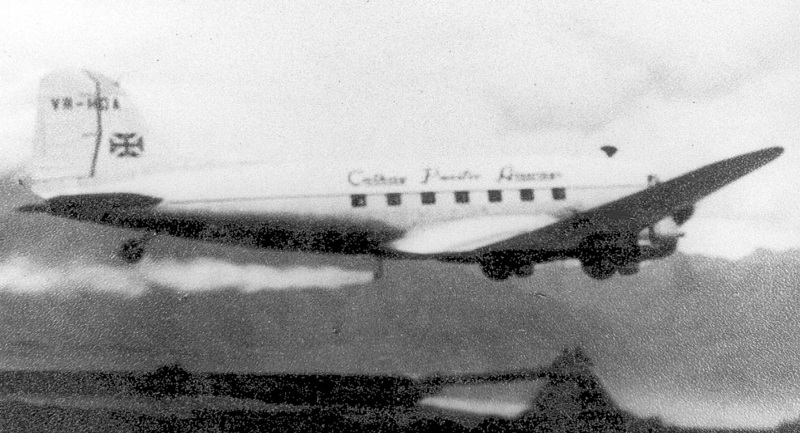 I had assiduously studied my notes and knew that a C-47 with this sort of height would have a safe single-engine performance. True, one must expect a gradual loss of height to retain a safe flying speed, so I settled back with my book learning until Pinky's usually calm and lazy voice screeched, "I can't feather the bloody port prop." This frightened the living daylights out of me and brought me back to reality in a rush, for without a feathering capability the C-47 had the gliding inclination of a rock. This made me realise I definitely was in the wrong environment. He then added some further useful, if obvious, information: "We've lost 3,000 feet and she's going down fast." I gave him the benefit of being rhetorical for the altimeter had me hypnotised. My eyeballs had recorded every lost foot. Pinky ordered me to get back and start jettisoning the cargo, so at last I had something to do. I bounded out of the right-hand seat (proud that I had remembered to unclasp my safety belt), but was unceremoniously jerked back. The same thing had happened with Jimmy Broadbent in a sabotaged Electra when I'd forgotten the stout headset cable. My savoir-faire took a tumble. Was I learning nothing from these emergencies? As I pushed past Pappy, his face was white and strained. I wondered why! With his experience, surely this was all child's play. Then I remembered the loss of his cargo would increase the strain on his struggling company. Nevertheless, first things first! With the help of Pouch and Charlie, the door was open in a flash and we began pushing out the expensive bales. With the loss of each one, Pappy's face became greyer. Then, just as I pushed out a large bale, Niki jolted severely and I swayed through the door. To this day I swear I saw the underbelly fuselage rivets but the strong hands of my colleagues grabbed my belt and hauled me back in. 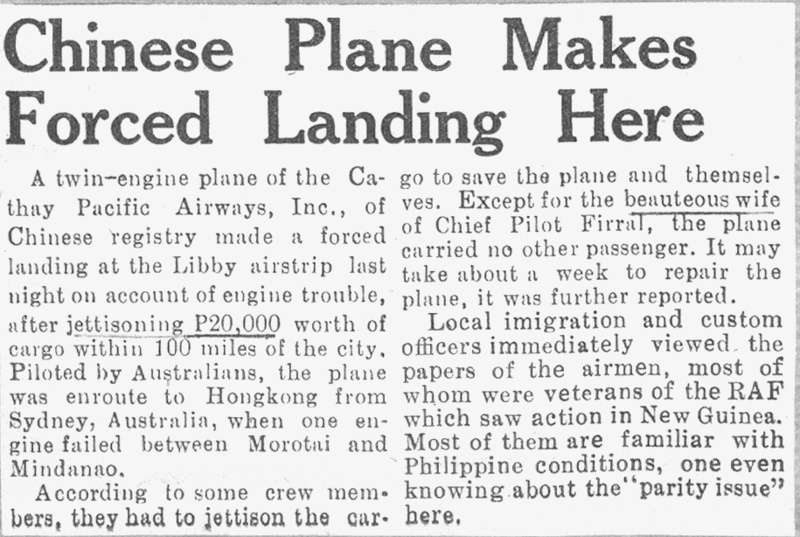 Mindanao Times, Davao City, Philippines, reported our forced landing on 21st December 1946. At that very moment, Pappy yelled that Pinky had feathered the prop and that the height had stabilised. As I scrambled back to the flight deck, Pouch and Charlie latched the cargo door. I could hardly believe my eyes: the altimeter read 1,500 feet. As a new boy and reluctant to make more of a fool of myself than was absolutely necessary, I stared but held my tongue. The loss of 7,500 feet is a sobering thought, and of greater interest - what if there had been no 7,500 feet to lose? 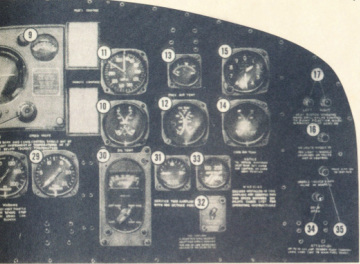 That lesson stayed with me all my flying life and I never rushed my pre-flight checks. Reaction to my close miss with disaster did not set in until some two days later. Then my overactive imagination saw visions of my portly body splashing into the shark-infested waters of the Davao Gulf. On a realistic level, the company had lost 20,000 pesos of cargo jettisoned 150 miles from Davao, and sundry items of expensive aircraft equipment. It came as no surprise when an extensive search by the authorities recovered nothing. The reprieve of our plane was due to Pinky's recollection that the erring prop was changed in Sydney in a rush. He rightly figured it was not bled correctly. 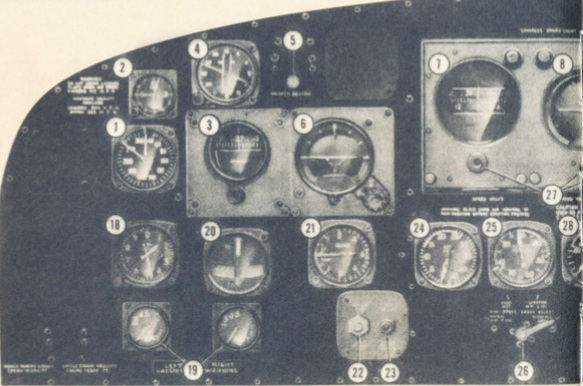 As the airstream turned the prop, he pushed the pitch lever that changed the blade angle and pressed the feather button. This proved successful. As the used fuel decreased Niki's weight, Pinky showed his class by coaxing her up to 3,000 feet, and we later landed at the old Japanese Libby Airstrip at Davao in southern Mindanao. Pappy found us rooms at Guino's Hotel where I made the acquaintance of the biggest mosquitoes I have ever come across. Throughout the night, cables flashed to and from Manila. 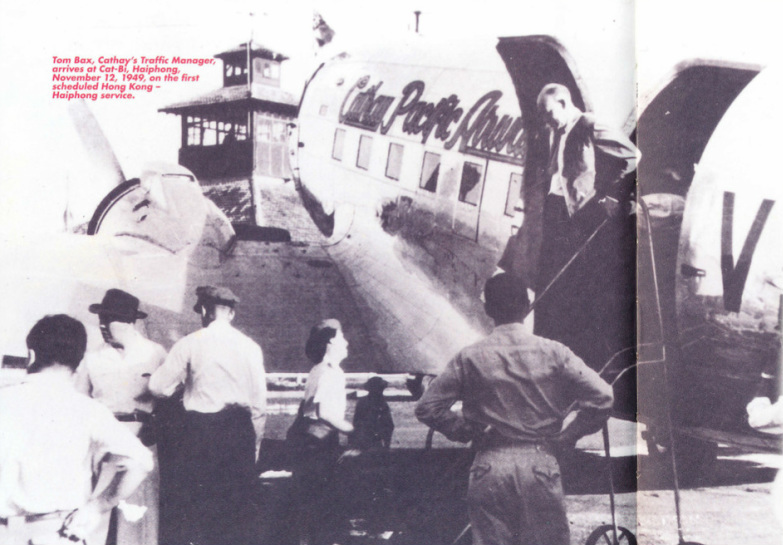 Pappy learned there was a spare engine at Manila and, as luck would have it, Betsy had a layover there. At first light, she brought the spare engine and I immediately returned to Manila with Pinky and Mum Louttit. 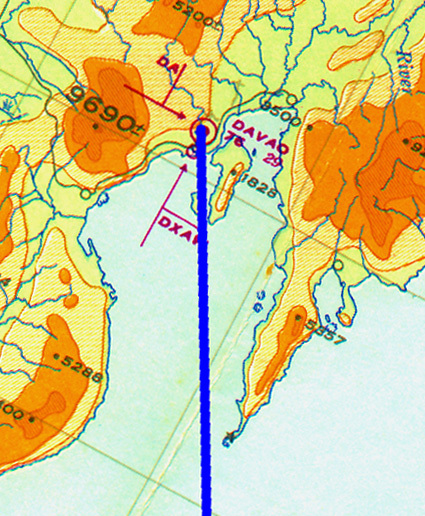 Enlarged area of the Davao Gulf and Libby Airfield, Davao, Mindanao, Philippines. 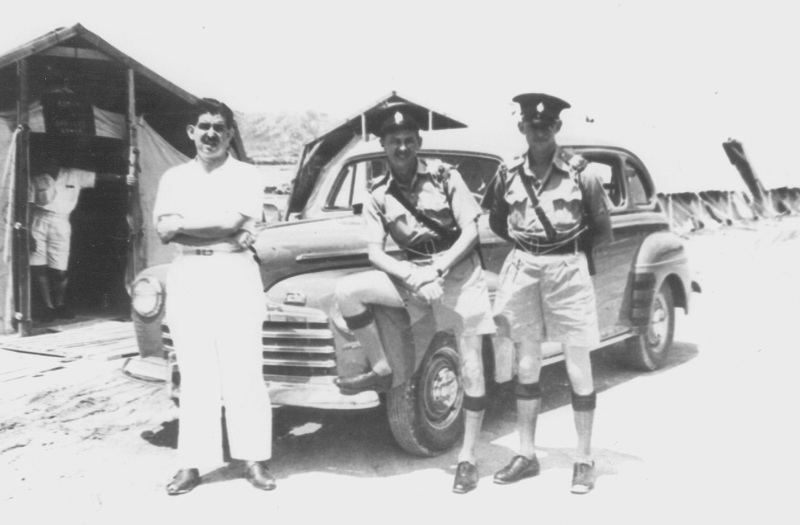 F/O Charles Chic Eather – CPA’s initial uniform. Pappy advised me that he would command the rest of the flight. He added that I would continue as first officer and asked if I could handle the radio as well. I assured him I could, but said that I would like Mum to run through the frequencies I might need. He agreed and later drove me to the hotel and suggested I get a good night's sleep. He then found a carpenter to build a cradle for the duff engine. This would make the loading easy for its return to Manila. Meanwhile, with all that engineering talent at his disposal, Pappy organised a gantry and overnight the sick engine was removed and secured on the wooden cradle. When the replacement engine arrived, its installation proved a simple task. The next morning, Pappy and I made a short test flight over Libby Airfield. The replacement engine performed well and we landed. 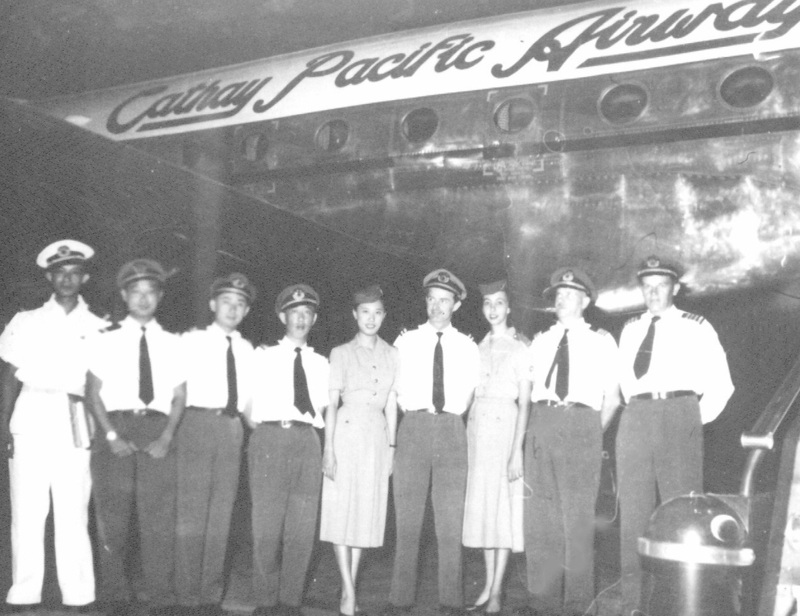 Without our cutting the engines, all colleagues scrambled aboard and we left for Manila. There followed a 20-minute stop for fuel after which Pappy taxied Niki out, lined her up and said, "Right, I want you to do the take-off." 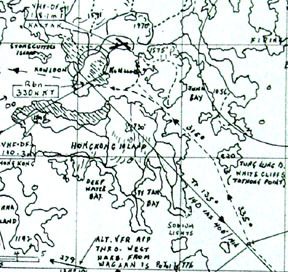 With the Chinese meteorology station on Pratas Reef slipping astern, a radio message advised that an unexpected squall line had struck Hong Kong airspace. Heavy rain and dangerous winds were hammering the area. As we approached the coast, the sky had darkened from milky grey to a sinister purple. Pappy explained that our usual approach would be on an NDB (Non-Directional Beacon) located at Hung Hom. It was on 330k and identified as KT. He added that in this storm it was useless. Then he lost altitude until we were skipping just above a gunmetal-­tinged windswept sea. With Waglan Island ahead, severe turbulence hit and Pappy asked me to help him on the controls. 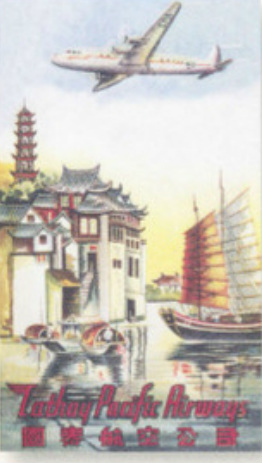 Then, straight ahead, I saw a vertical sliver of light a quarter-mile wide, Lei Yue Mun Pass. As we inched through the pass, the pelting rain rendered the wipers useless. Safely through the pass, we entered an unidentifiable vacuum. Pappy said: "The Harbour," his voice seeming to register more hope than conviction. He ordered me to keep a good lookout. "For what?" I pondered. I had never been to Hong Kong before! But this seemed an inopportune moment to engage in small talk. To show I understood his order and with forced savoir-faire, I slammed open my storm window and within seconds was drenched by freezing rain. Pappy, nodding his approval, copied my action and suffered the same fate, which for some reason gave me great pleasure. 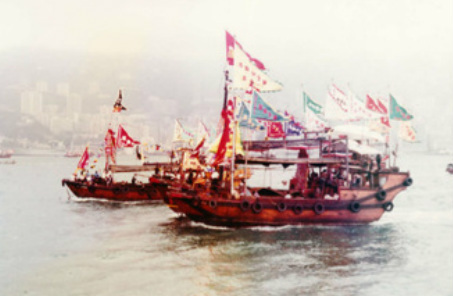 With a yell, and a vicious stab on the rudder pedal, he brought Niki around a huge Chinese junk that gave me such a clear view of the helmsman that I fancied I could read his mind. We hurled past the Peninsula Hotel at rooftop level. I saw, for a fleeting moment, a vague shadow that Pappy yelled was Stonecutters Island. As an easterly turn brought us into the circuit for the runway - a circuit that must have existed mainly in Pappy's memory - my bulging eyes saw ghostly buildings dead ahead that somehow moved aside, at the last moment, to let us pass. I squirmed as a hilltop cemetery flashed beneath with the thought that the undertaker wouldn't have far to bring the broken body parts from the crash scene. Then I saw Pappy's face soften to a grin - he knew that final resting place put us onto our final approach. As Niki touched down on the water-saturated runway, he hit the brakes. 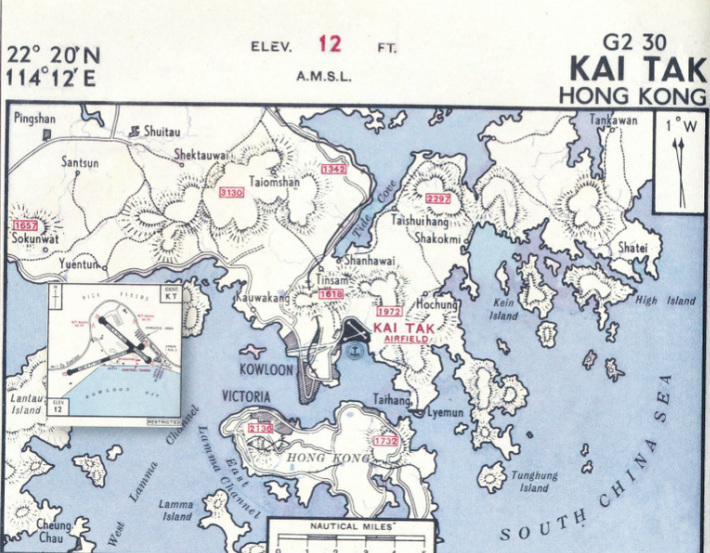 The dashed line shows the contact approach from Waglan Island, past the white painted cliffs at Tathong Point, through the Lei Yue Mun Pass, then into the Harbour. 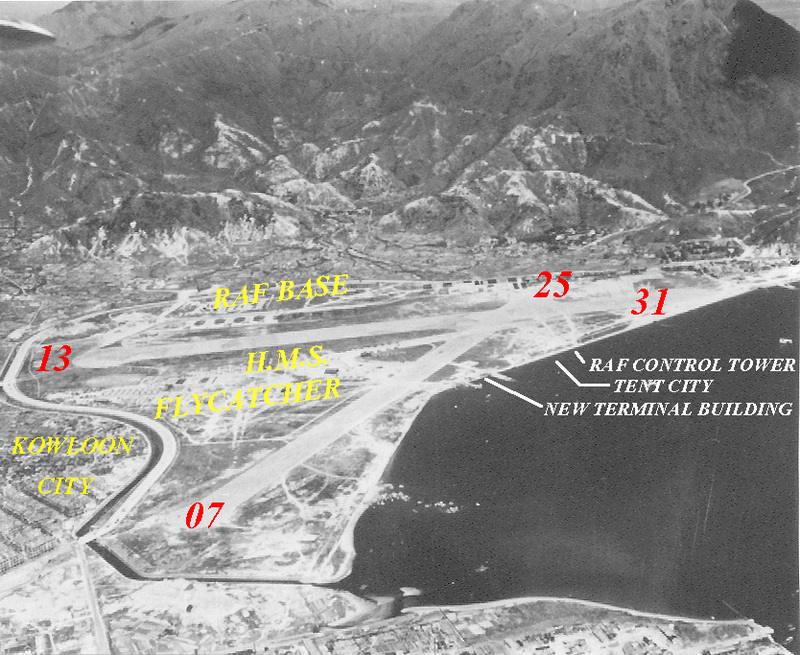 We skirted the Peninsular Hotel, turned at Stonecutters Island, and made a right hand circuit onto Kai Tak’s Runway 13. A bit of local knowledge paid dividends! I found myself hoping that the slight reduction in speed was not all imagination - I had recently read a terrifying article on aquaplaning. With the danger over, I felt a wild exhilaration - one I would feel again and again - of outwitting the most dangerous and exacting airport in the world. Then, right on cue, out came the sun. Pappy slowly taxied to his assigned spot and cut the engines. He looked at me, winked and said, "How do you like your new work environment?" Then, with a sigh, he suggested we had better clear the necessary requirements. 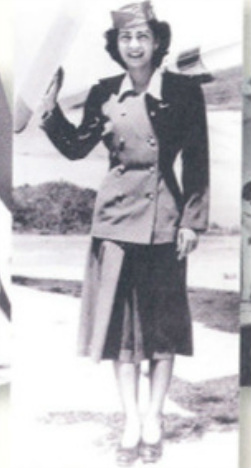 He led me along a series of precariously floating duckboards that ended at the open flap of the first of several Royal Air Force tents that were erected on the sea wall. This was the spartan accommodation from which Immigration, Health and Customs performed their duties. As I cleared the Customs, I saw Pappy in deep conversation with Syd, who caught my eye and bounded up with outstretched hand and a smile a mile wide. Apparently, Pappy had given me a good rap. 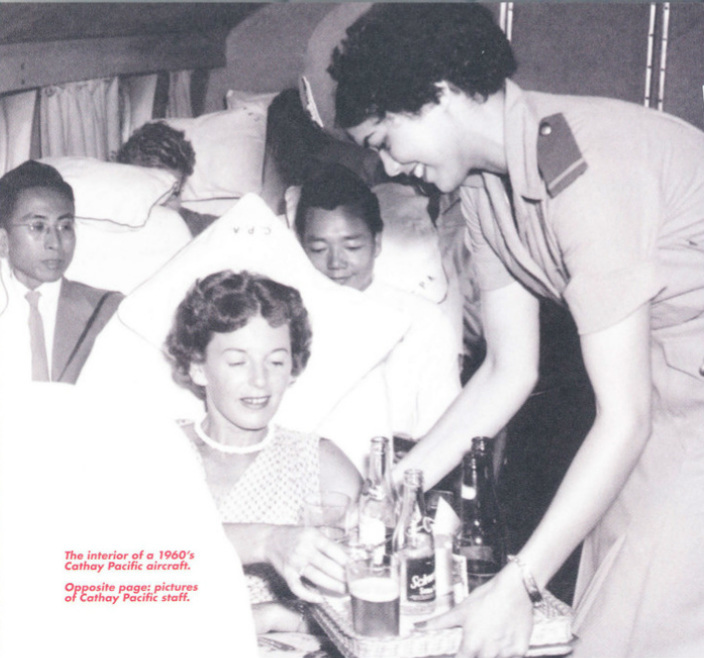 He then introduced me to Cathay Pacific's Public Relations Officer, Bill Dobson. Then with a nod from Inspector F. "Buck" lndge-Buckingham, the senior duty policeman, we walked to the centre of the airfield. From that position, Syd gave me a concise familiarisation briefing. 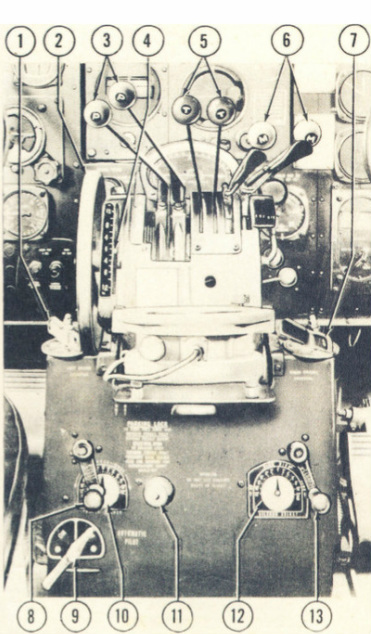 His finger traced the RAF Control Tower that controlled both service and civilian plane movements, and then moved to the HMS Flycatcher and the RAF establishment buildings. 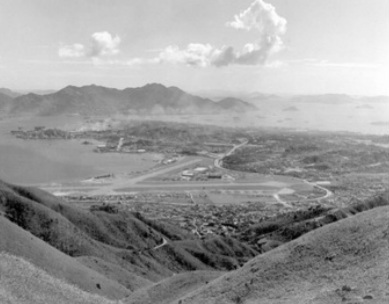 He pointed out the towering mountains that cupped the airport to the east and north. This he described as the Nine Dragons - probably the best known of which was Lion Rock. Then his finger moved to clear of hilly ground. He grumbled that the line of milky smoke that hid the western horizon came from local manufacturing plants. When this was mixed with low cloud, visibility was zero. As his gaze moved left, he indicated the Peak on Hong Kong Island. Further left was an uninspiring concrete monstrosity that festered on the crest of Mount Cameron - the Japanese War Memorial. 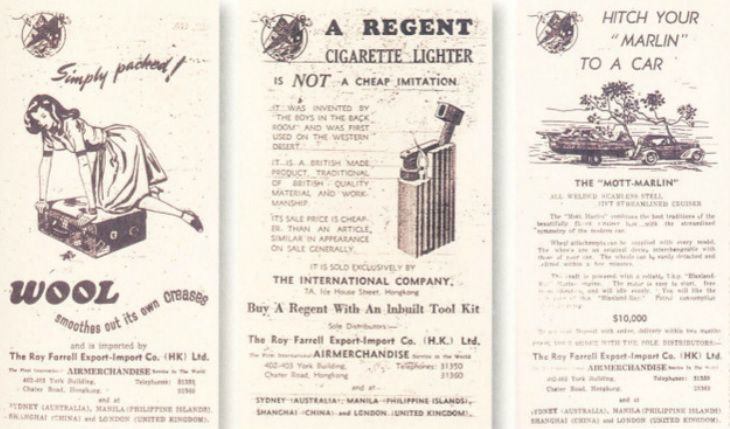 Its only redeeming feature, Syd said, was its value to the aviator. When the afternoon sun bounced off its surface, one could pick up its glitter from Pratas Reef some ninety miles away. 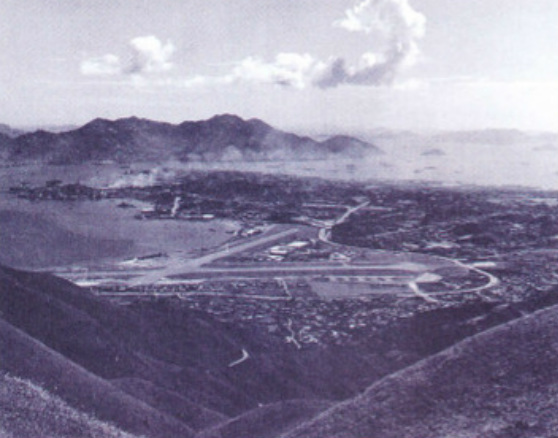 After adding that Mount Parker, further left, was probably the greatest danger of all, he chuckled, and said, "You already know about Lei Yue Mun Pass." Fixing me with a beady eye, Syd snarled that I must never be party to a take-off that pointed at Lion Rock. 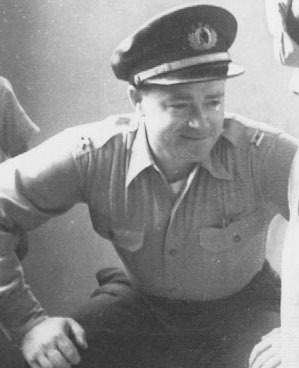 To drive home his point, he described in gory detail the crash of an RAF flight three months earlier. 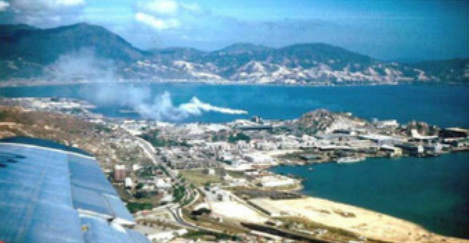 Nineteen lives were lost when it crashed into the foothills of Kowloon Tong. He moved back to the seawall to a partly completed brick building. 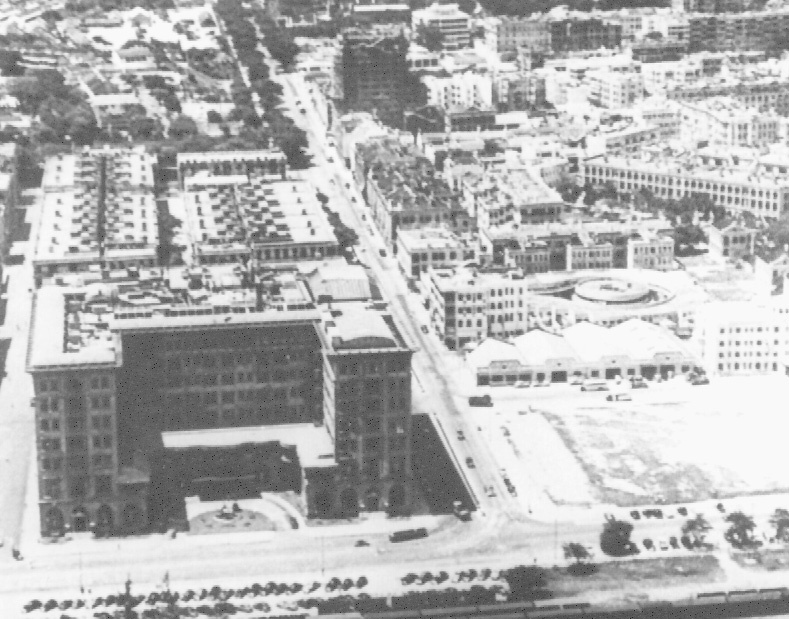 This, he stated, was to be the first substantially built post-war terminal. With a few other minor remarks, he brought the briefing to a close and stated that he would drive me to my digs. Bill, who doubtless had experience of his driving, found other business that needed his attention. Capt. Sydney Hugh Syd de Kantzow – Tiger Hunter 1945. That drive proved to be the most dangerous leg of all, with Syd weaving in and out of traffic with proprietorial disdain. Other road users seemed conversant with his methods and moved swiftly to the safe haven of the nearest curb. I was terrified but my fixed grin seemed to project that I was thoroughly enjoying his bout with Providence and he seemed to further mellow to me. We covered the five miles in four minutes; then, with screeching brakes and the smell of burning rubber, I was deposited at the main doors of the imposing Peninsula Hotel. 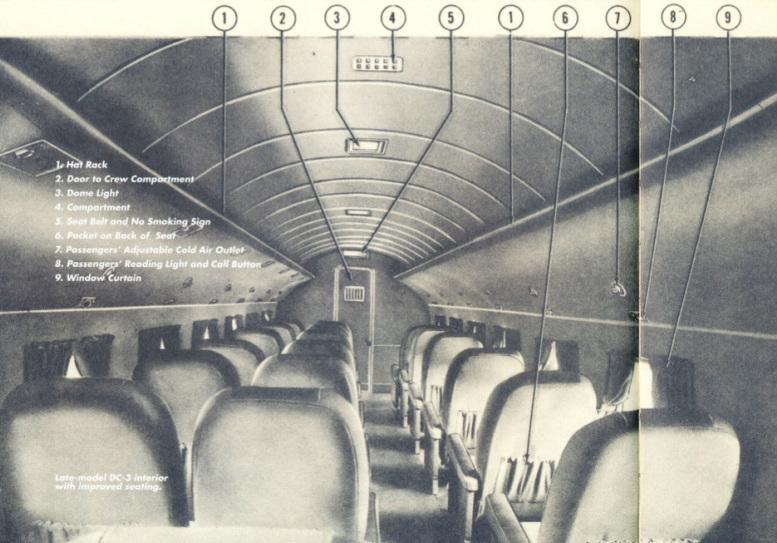 There the company reserved two rooms for transiting crew in what became known as the "upholstered sewer". Each room was crammed with camp beds that never seemed empty. Syd selected one that he guaranteed was full of sleep, but this luxurious accommodation lasted just two nights. 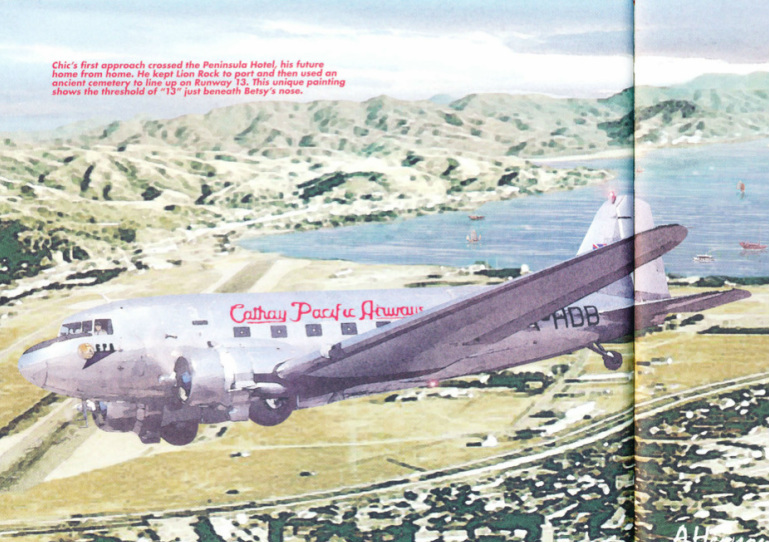 On December 23, I found myself on VR-HDG, Cathay Pacific's third C-47, on my way back to Sydney. A week later, I was back in the Peninsula Hotel, snug as a bug in a rug in my favourite camp bed. 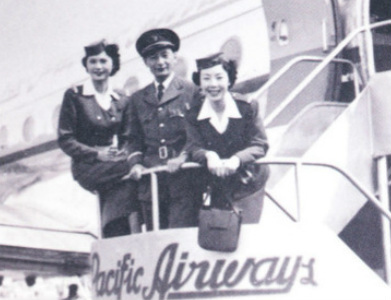 My log book shows that, during my first fortnight with Cathay Pacific, I logged 94 hours of flying time, during which time I had two days off. With that pace, this virile company would burn me out within a month. But how wrong were those thoughts, for I thrived on what lay ahead, and for the next three decades Kai Tak was to be my home away from home.